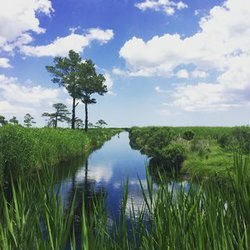 With funding from the National Science Foundation's Coastal Sustainability Program (Coastal SEES, 2014-2019), we are examining the effects of saltwater intrusion on NC's coastal ecosystems and communities. This new research requires creating hydrologic models of potential saltwater incursion patterns, mapping the infrastructure (canals, pumps) that determine hydrologic connectivity in this landscape; measuring the impacts of salt exposure on vegetation, soils and water quality; and exploring how landowners and decisionmakers understand and react to information about climate change predictions in this region. This work is in collaboration with hydrologist Ryan Emanuel (NCSU), environmental planning expert Todd BenDor (UNC, CH), fellow ecosystem ecologist Marcelo Ardon (ECU) and plant ecologist Justin Wright (Duke). PhD student Emily Ury and research associates Steve Anderson and Christina Bergemann work on this project. Previous funding from the National Science Foundation Ecosystem and Hydrology Panels, the Department of Energy's National Institute of Climate Change Research, the Great Dismal Swamp Mitigation Bank, LLC, the NC Water Resources Research Institute and the NC Department of Environment and Natural Resources focused on understanding the consequences of converting formerly cultivated and fertilized farmland to wetland with respect to promoting denitrification vs. generating dissolved phosphorus and greenhouse gas pollutants. Former postdoctoral associates Marcelo Ardon and Ashley Helton and former PhD student Jen Morse led these efforts. This work was in collaboration with Martin Doyle (UNC), Geoff Poole (Montana State University) and Amy Burgin (Wright State University). From Syndrome Diagnosis to Watershed Prescription - Is all development created equal? With funding from NSF Ecosystems (2013-2016) we are exploring how development configuration and connectivity (as opposed to sheer amount of development) influences the delivery of stormwaters and storm-borne contaminants (e.g., heat, trace metals, pharmaceuticals and personal care products) to urban streams in central North Carolina. We have selected watersheds that have similar amounts of their area converted to impervious surfaces but widely varying patterns in the distribution of those developed surfaces within the watershed, the age of the development (and its associated urban trees and urban pipes), and the degree to which the pavements are connected via stormwater pipes directly to stream channels. PhD student Joanna Blaszczak helps lead this project which is in conjunction with landscape ecologist Dean Urban (faculty in Duke's Nicholas School of the Environment). As part of the Center for the Environmental Implications of Nanotechnology (CEINT), funded by NSF and the US EPA, we are examining the effects of manufactured nanomaterials on microbial and plant community structure and function in soils and sediments. Much of our work to date has focused on understanding how silver nanoparticles (often produced for their antimicrobial properties) affect ecosystem structure and function. Our current work is shifting in focus to look for engineered and incidental nanomaterials as components of both domestic and industrial wastewaters and to explore the role of nanoparticles in altering the fate, transport and toxicity of organic and metallic contaminants. This work is in collaboration with many of the faculty within CEINT but involves particularly active collaboration with ecologists Ben Colman (University of Montana), Curt Richardson (Duke), and Ryan King (Baylor U. ); geochemist Mike Hochella (VA Tech); and toxicologists Cole Matson (Baylor U.) and Rich DiGiulio (Duke). Postdoctoral associate Marie Simonin and research associates Steve Anderson and Christina Bergemann leads this effort. 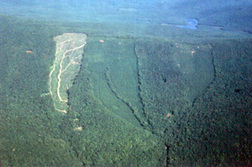 Mountaintop mining is currently the largest land use change in the Central Appalachian region. This method of extracting coal involves using explosives to remove overlying layers of rock in order to access and extract shallow coal seams. As mountainsides are removed the large volumes of displaced rock are often placed in stream valleys to create valley fills. An estimated 1800 miles of headwater streams have been buried by mountain top mining in the last 3 decades, and our research examines the downstream and cumulative impacts of MTMVF activities on stream ecosystems. Funds from the National Science Foundation Hydrology Panel (2014-2017) and from the Foundation for the Carolinas provide an opportunity to initiate research aimed at explicitly linking water quality degradation to altered stream biological communities and nutrient cycling. To address these objectives, we are using routinely collected water chemistry data to establish longitudinal water quality patterns that will inform nutrient use experiments and patterns in microbial communities. We are also analyzing synthesized datasets of water chemistry, macroinvertebrate, algae, and fish in the Central Appalachian states. This work is in collaboration with many fellow Duke faculty, including toxicologist Rich DiGiulio, hydrologist Brian McGlynn, microbial ecologist Jennifer Wernegreen and mycologist Rytas Vilgalys. PhD students Matt Ross and Jackie Gerson are conducting their dissertation research on aspects of this isssue. The collection of organisms found within stream ecosystems (algae, bacteria, fungi, macrophytes, insects, fish, salamanders...) all contribute to a stream's metabolism - or its regular consumption and production of O2, CO2 and biomass. With funding from the USGS Powell Center and the NSF Macrosystems program, we are seeking to understand how the rates and patterns of stream metabolism vary within and across streams. Our current funding is supporting data synthesis and data collection for more than 300 US streams but we hope to foster a global effort to harness new and cheaper sensor technologies to measure the pulse of streams all over the planet. This work is in collaboration with Brian McGlynn and Jim Heffernan here at Duke as well as Tom Battin (EPFL), Matt Cohen (UFL), Nancy Grimm (ASU), Bob Hall (UWY), Ashley Helton (U Conn), Bill McDowell (UNH), Pete Raymond (Yale), Emily Stanley (UWI) and two incredible information science gurus Jordan Read and Alison Appling at the USGS Center for Integrated Data Analytics. Postdocs Aaron Berdanier and Phil Savoy and PhD student Alice Carter are all working on different aspects of this project. Since her dissertation work, nothing in this world gets Emily as excited as a long-term dataset of nutrient fluxes. So far with very little funding but a great deal of enthusiasm members of the lab group have been engaged in understanding controls on the timing, magnitude and form of watershed N fluxes from a variety of long-term ecological research sites including streams of the Hubbard Brook LTER, Walker Branch at Oak Ridge National Labs, Pond Branch in the Baltimore LTER, and streams of the Coweeta LTER. Currently Bernhardt and PhD student Richard Marinos are working in collaboration with Gene Likens and Emma Rosi-Marshall (Cary Institute of Ecosystem Studies) to explore the effects of climate change and experimental treatments on patterns of watershed N export at Hubbard Brook.